Jessica B. Hill, left, as Emily Brontë and Andrea Rankin as Anne Brontë in Brontë: The World Without. Charlotte. Emily. And Anne. The Brontë Sisters. You can almost sing it to the tune of The Schuyler Sisters from Hamilton: An American Musical. 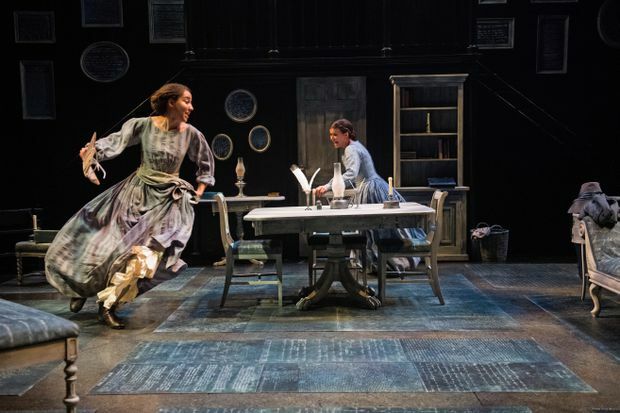 And with a young female playwright holding the pen and a diverse cast, the Stratford Festival’s new play, Brontë: The World Without, promised just such a similarly fresh, contemporary take on the 19th-century English writers who brought us the novels Jane Eyre, Wuthering Heights and The Tenant of Wildfell Hall, respectively. Playwright Jordi Mand gives us scenes as flat as roadkill from the lives of Charlotte, Emily and Anne, all set in the parlour of their father’s parsonage. The first is all economic exposition as Charlotte (Beryl Bain), Emily (Jessica B. Hill) and Anne (Andrea Rankin) sit around drinking weak tea and talking about how little money they have and how they might make ends meet. As each possibility is crossed off the list – selling this or that possession, opening a school, tapping into a small inheritance – it’s a long wait for them to turn to the idea that they might try to publish the poetry that they’ve been writing in private. It’s such a long wait, in fact, that it takes until the second scene for Charlotte to finally have her unbelievable light-bulb moment. The rest of the space before intermission is taken up by Charlotte and Anne trying to convince the fragile and frightened Emily to send her poetry off to a publisher under a male pseudonym along with them. No such luck. But there is the potential for drama between these underwritten writers when a thin brown-paper package returns from a publisher. Clearly, two of the Brontës have had their first novels accepted and one has not. Having made the mistake of reading the program notes before the play began, this was another tedious scene of non-suspense waiting for the package to be opened – but I remained curious to see how the sisters would handle this moment of division. Alas, the discovery of who was rejected is where Mand ends her scene. And the next one picks up after such a long enough passage of time that the whole issue is rendered moot. Director Vanessa Porteous, as if realizing that the play she’s been hired to direct is missing, stages long scene changes set to songs. Entire songs by Regina Spektor, Willow Smith and Meshell Ndegeocello. These little music videos fill out the lives of the characters in a more lively way than the play itself. They wake you up, anyway – as Charlotte, Emily and Anne walk in and out of doors on fast-forward, shoot each other looks and furiously scribble with quills. But then they’re back to quarrelling and quibbling, speaking flavourless dialogue that feels neither period nor contemporary. Biographical tidbits are occasionally revealed, but there are no peeks inside of these iconic authors’ minds or imaginations, except into Anne’s in the very final moments of the play. Not a poem is read. Not a novel discussed. Love affairs, an alcoholic and opioid-addicted brother, a trip to London by Charlotte and Anne where they reveal to their publishers that they are women – all these potentially dramatizeable elements are kept off the stage. A character’s death is signalled entirely by coughing into a napkin and then showing that there is blood on it. This is a play premiering in 2018? The cast is talented – with Hill, in particular, bringing an on-the-edge element to the character of Emily. And Mand proved herself a talented writer with a show called Between the Sheets, developed and premiered by the independent company Nightwood in Toronto back in 2012. The largest not-for-profit theatre company in the country, with all its resources, seems to have transformed her into a bland one. Stratford has let her down and, in turn, audiences by letting this pointless period piece make it all the way to production.